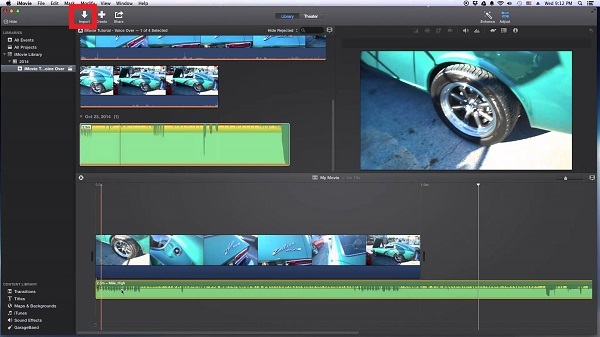 iMovie is a powerful video editing application and specifically designed for amateur users. And it comes preinstalled on every new Macintosh computer. With a clean and elegant interface, you can create and produce high-quality movies from videos shot on all kinds of devices easily. In addition, you can add sound effects and music to your movies, iMovie provides bank of background music and special effects, tracks from your iTunes library, your own Garageband creations, and even your own voice narration. Why Apple Music can't be added as background sound in iMovie? Unfortunately, you can't import Apple Music to iMovie for editing. That's because Apple Music is just a music streaming service that brings 45 million songs to built-in iOS Music app, desktop iTunes app, or Apple TV. Apple Music can be downloaded for offline listening. However, the downloaded tracks come with DRM protection which restricts the use of Apple Music on authorized devices only. This is why you can't sync your Apple Music to iMovie successfully. It is a fact that you only pay for the service to use it, but you still don't have the right to use the tracks from Apple Music to iMovie. 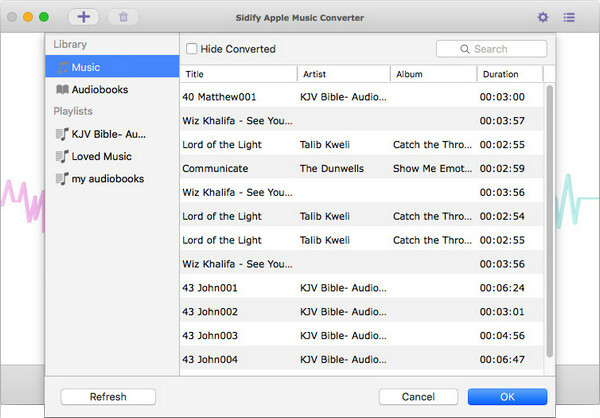 Take it easy, Sidify Apple Music Converter is strongly recommended to you. 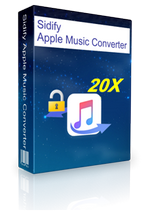 It is a handful Apple Music Converter which enables you to convert Apple Music to unprotected audio formats so that you can add the converted Apple Music to iMovie with no limits. Now you can follow the detailed tutorial below to learn how to get rid of DRM from Apple Music and then add the converted Apple Music files to iMovie as background music within a few clicks. 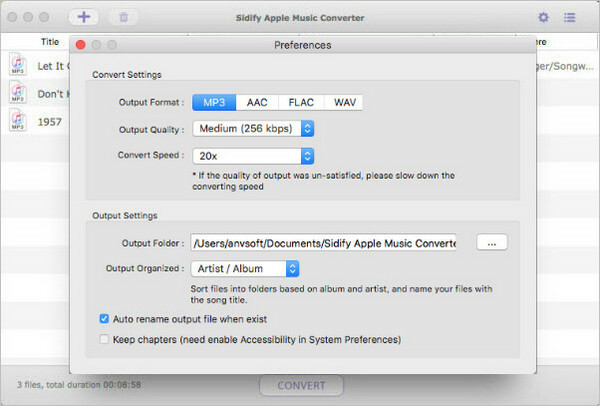 Before starting, you need to download and install the latest version of Sidify Apple Music Converter on your Mac. 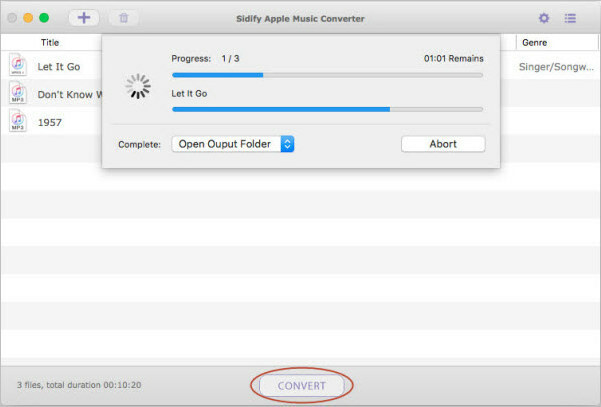 Launch the Sidify Apple Music Converter, then click + button to select the downloaded Apple Music files you want to convert from the pop-up adding window, then hit OK.
All the added files will be listed in the main interface, now you can click settings gear icon on the top right corner of the window to choose a suitable output format for iMovie. Audio files in your iTunes can also be placed in iMovie. Here we suggest you choose MP3 or AAC as output format. At the same time, you can customize the output path by changing the Output Folder. Click CONVERT button to start removing the DRM protection and convert Apple Music to iMovie supported MP3 format. After conversion, you will find the converted Apple Music files on the storage path you set. Open iMovie on your Mac and import the videos you want to edit firstly. Then you can add Apple Music to iMovie by clicking Import option. Or you can use the browser to select a track you want to add to your video. The added tracks will appear as a green audio track below the video.